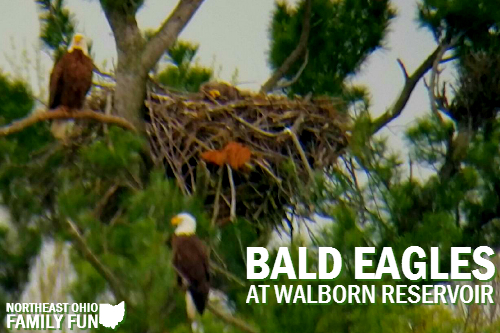 There are multiple bald eagle nests located in Northeast Ohio that have been used each year by various pairs of eagles. Below is information on three nearby nests including the nest at Walborn Reservior, Rocky River Reservation and Sandy Ridge Reservation. 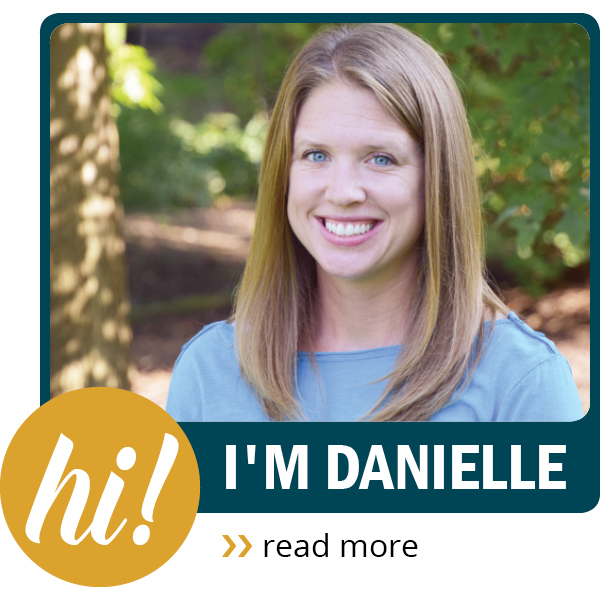 According to the Eagle Report, the eagle's at Walborn Reservoir have been returning to the nest since 2005. The eagle's arrive each year in the January / February time frame and typically stay until the end of the summer. Visitors are welcome to come visit the observation area at any point during the day from dawn until dusk. Depending on when you visit the observation area, you may be able to see the adult eagles building the nest, taking care of the eggs, or feeding the baby eaglets. Stark Parks provides regular updates on the activity at the eagle's nest in the Walborn Reservoir Eagle Report. 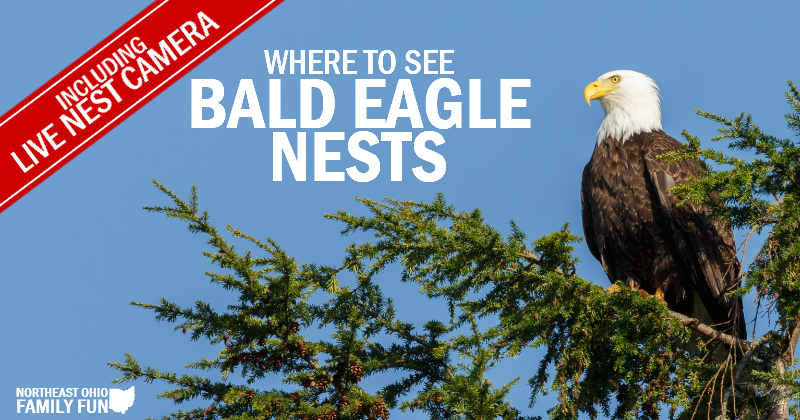 In addition to being able to see the eagles in wild, the observation area contains information about the nest and some fun facts about bald eagles. Did you know that an eagle's nest can weigh as much as an elephant? When we visited there was a park volunteer with a spotting scope set up at the observation deck. This allowed us to get a better view of the eagles. The picture above was taken on a phone that was held up to the spotting scope. You can see the two adult eagles perched by the nest, and the baby eaglet laying on top of the nest. Helpful Tip: Because the nest is probably 1/4 mile from the observation deck, you will want to bring binoculars or a spotting scope so you can get a better view of the eagles and the activity in the nest. According to the Stark Parks facebook page volunteers are typically there Tuesday and Thursday evenings, Saturdays from 3-6pm and sometimes on Sunday afternoons if the weather is good. 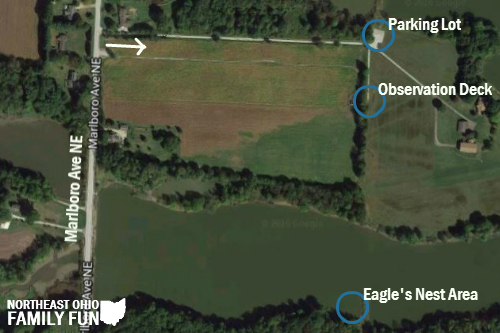 You cannot get to the location of the Eagle's Nest from the main entrance of the Stark County Park District-Walborn Reservoir. Instead you will find a road leading to the Parking Lot off Marlboro Ave NE. There will be a sign on Marlboro Ave NE pointing you to the direction of the Eagle's nest. Once parked, you only need to walk a short distance to the observation deck. 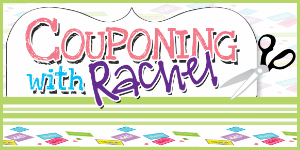 Helpful Tip: Use 13600 Marlboro Ave NE, Alliance, OH 44601 as the address in your GPS. This should take you close to the point on Marlboro Ave NE where you will see the sign and can turn down the drive to the parking lot. This year two eaglets hatched in the bald eagles nest at Rocky River Reservation. You can visit the Cottonwood and Mastick Picnic Areas for a chance to see one of the adults flying back & forth to the nest or perched on cottonwood & sycamore trees along the river's edge. A pair of Bald Eagles have been nesting at Sandy Ridge Reservation since 2002. They have built a total of three nests and have been using the current next since 2012. This year (2018), one eaglet hatched. You can watch previously recorded videos of the activity in the nest and even watch a Live Eagle Nest Camera on the Lorain County Metro Parks YouTube Channel. Know of any other nearby Bald Eagle Nests? Leave a comment and let us know. Thanks!